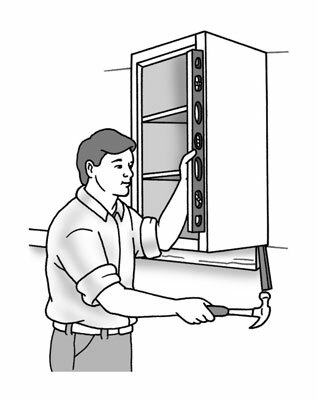 Install wall cabinets before you install base cabinets so you don’t have to work above the base cabinets. The open area of the floor allows you, your helper, and your step ladder clear access. These steps describe installing framed cabinets. Frameless cabinets are installed in much the same manner except when connecting adjoining cabinets. To join frameless cabinets, use wood screws that are just shorter than the thickness of the two cabinet sides. Transfer stud locations from the wall to the inside of each cabinet before you lift it into place; and drill clearance holes for the mounting screws. Clearance holes, which are the same diameter as the screw, ensure that the cabinet will be drawn tight to the wall by the head of the screw. Measure carefully and measure twice. Drill the holes in the upper and lower hanging rails of the cabinets (the two horizontal pieces of lumber along the top and bottom of the back of the cabinet). Set the first wall cabinet on the ledger strip and 1/4-inch away from its reference line on the wall; secure the top and bottom of the cabinet to the wall with 3-inch-long #10 cabinet screws. Snug up the screws as you go, but don’t tighten them completely. You’ll go back later for a final tightening of all the screws after cabinets are aligned with each other, joined together with screws and plumbed. If you have a helper, have her hold the unit in place while you secure it with screws. If you’re working alone, cut some lengths of lumber and make a V-shaped notch in one end. Use these pieces as braces by placing the notch against the bottom of the cabinet and wedging the lumber up to hold the cabinet in place. Put a rag or piece of cardboard over the cabinet where the notched lumber will go to protect the cabinet’s finish. Position the second cabinet on the ledger and next to the installed cabinet. Attach it with screws as you did the first one. Join the two cabinets with two clamps, located about 1/4 of the distance from the top and bottom. Use wooden screw or short bar clamps with padded jaws that won’t mar the cabinets. As you tighten the clamp, ensure that the face, top, and bottom of the two frames are all perfectly flush. Drill clearance holes through the face frame, countersinks so that the screwheads will be flush with or below the surface, and pilot holes in the adjoining cabinet. Locate the holes at the hinge positions so when the hinges are installed, the screwheads will be concealed. The easiest way to drill these holes is all at once, using an adjustable combination bit. Drive 2 1/4-inch drywall screws into each hole and remove the clamps. If the holes are not properly sized or if you overdrive the screws, they can easily snap off. Use the proper bits and adjust the clutch on your drill/driver to limit the torque. Install the remaining wall cabinets along this wall in the same manner and then remove the ledger. If the plan calls for a filler strip at a particular location, clamp it to the face frame and attach it as you would attach two cabinets together. Starting at the corner, plumb the cabinets using the reference line on the adjacent wall and a 2-foot level, and insert shims as required. Install shims behind the cabinet at the bottom or top as indicated until the cabinet is plumb and the proper distance from the reference line. Back out an installation screw, insert the shim until the cabinet is plumb and drive in the screw. When all cabinets are plumb, trim off the shims. Similarly complete the installation of cabinets first on adjoining walls and then other walls. 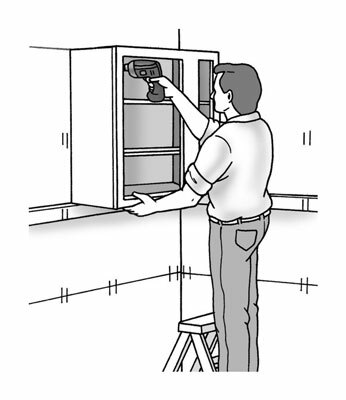 Clamp the filler strip in place and drill 3/16-inch pilot holes through the cabinet face frame and filler strip, using a countersink bit to recess the screw head into the face frame. Secure the strip with 3-inch drywall screws. Reinstall the doors and check each one for smooth operation. Be careful when redriving the screws for the hinges. The screws are generally made from a fairly soft metal, which makes the heads easy to strip and the shafts easy to snap off.